*Black and white trousers in the style of RedFoo. RedFoo Wig and glasses sold separately. 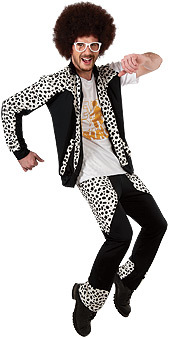 Don't be sorry for Party Rocking all night long in this Red Foo Party Rock Anthem Costume, it was made to be danced in! Look the style and comfortable rock til you drop in the sensational one part of the dancing duo, LMFAO!